Herbal medicines have been used in China for at least 2500 years. There are 5,767 medicinal substances currently in use. These substances are occasionally used singularly, but more often they are used in time-tested combinations or blends. 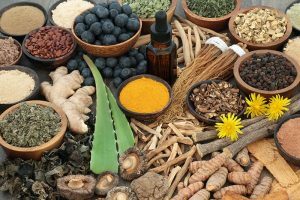 The benefit to herbal blends is these substances are often combined in a way that best balances any property of the individual substance to avoid side effects that could be experienced if one of the substances was used alone. Many of these formulas have been around for hundreds or thousands of years and used by millions of people, far more history and use than any modern medication that is used in Western medicine. Therefore, blending herbals with a traditional Western treatment plan can offer some balance to the overall treatment strategy and potentially result in better outcomes than Western therapy alone. Although herb and drug interactions can occur, they are very uncommon. We can help create and evaluate a integrated plan for you pet that you feel comfortable about.